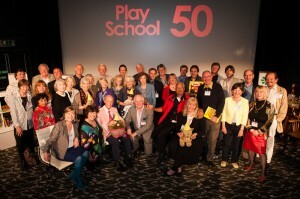 Producers, directors, presenters, musicians, storytellers, designers – everyone who helped make Play School an iconic pre-school institution – gathered at Hammersmith’s Riverside Studios to celebrate 50 years since Play School first transmitted – as the accidental first-ever programme on BBC TWO. From April 21st 1964 Play School transmitted daily on BBC Two. It spawned spin-off programmes around the world and launched the careers of many – especially those who continued to deliver its unique pre-school excellence in successor series from “PlayDays” to “Show Me Show Me”. Play School set the standard by which Britain is recognised as pre-eminent in pre-school production, across the world. Riverside Studios was the home of the early episodes of Play School and it was to Riverside that the creators and friends of the programme returned, to swap stories, raise a glass or two and wish the Teds, Humpty and Jemima a Happy 50th Birthday. The Children’s Media Foundation is proud to have set this unique celebration in motion and congratulates the organising committee of ex-Play School staff for their hard work in planning the afternoon. Photos and video are available here. We Need To Talk About Children’s Film CMF at CMC 2014 – Charter Renewal: The Great British Sell Off?